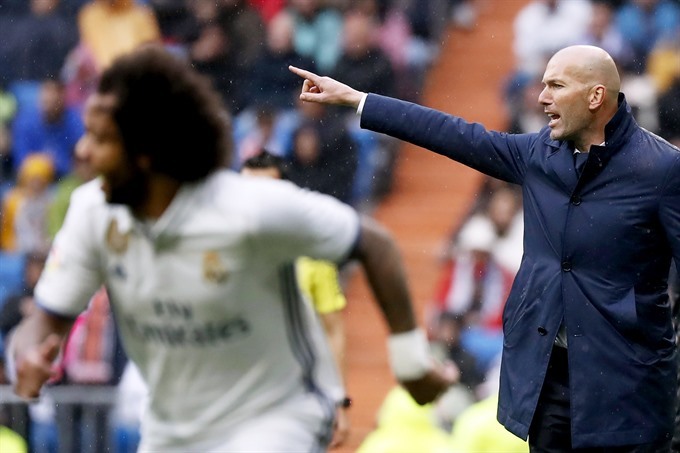 MADRID — Real Madrid coach Zinedine Zidane insisted he can’t explain his side’s penchant for late goals, but is excited rather than concerned by need to constantly go to the wire. Marcelo struck four minutes from time as for the seventh time this season Real won a La Liga game in the final 10 minutes by edging out Valencia 2-1 on Saturday. "We know our stats of goals scored in the last few minutes," said Zidane. "That is the reason football is so wonderful and you can’t over-analyse things too much. I can’t explain why. "It is great to win games in the last 10 minutes. It’s exciting." Cristiano Ronaldo endured a mixed day in front of goal despite setting more history. The Portuguese surpassed legendary English striker Jimmy Greaves as the all-time top goalscorer in Europe’s top leagues when he headed home his 367th league goal midway through the first-half. However, Ronaldo then saw a second-half penalty saved by Valencia’s spot-kick specialist Diego Alves. The visitors then looked set to add a new twist to the title race when Dani Parejo curled home a brilliant free-kick eight minutes from time. And Zidane admitted his side nearly paid for taking their foot off the gas in the second period with Tuesday’s Champions League semi-final, first leg against Atletico Madrid in mind. "It is true that we were in a comfort zone for 30 minutes, the fans were the same," said the Frenchman. "After Valencia scored they started to push the players on once more and it was a completely different match.